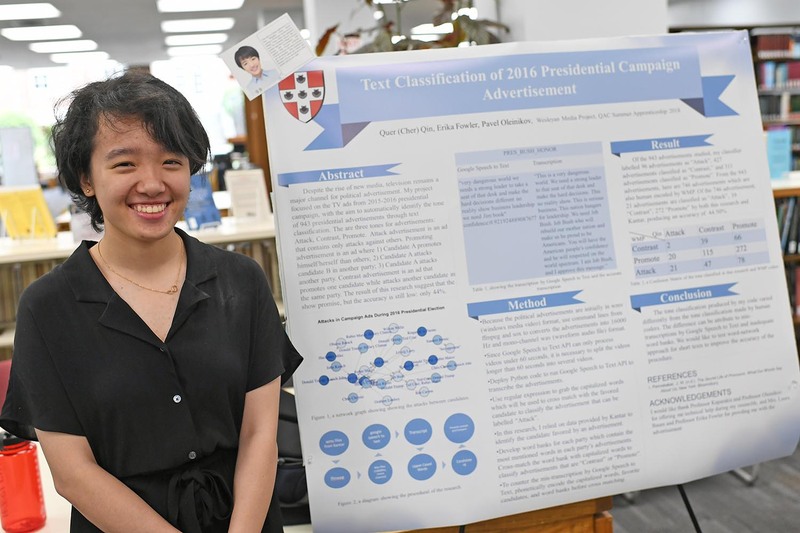 Cher Qin ’21 presented her quantitative analysis study titled “Text Classification of 2016 Presidential Campaign Advertisement” during a poster session July 26. Qin’s advisors are Pavel Oleinikov, associate director of the Quantitative Analysis Center, and Erika Franklin Fowler, associate professor of government. 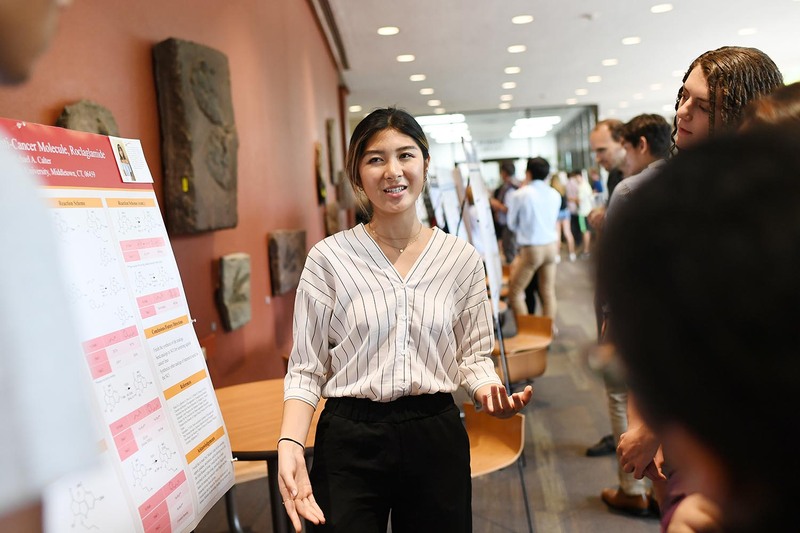 More than 135 undergraduate research fellows shared their summer-long research during a poster session on July 26 in Exley Science Center. Students from the Psychology Department, College of the Environment, Biology Department, Neuroscience and Behavior Program, Chemistry Department, Physics Department, Astronomy Department, Math and Computer Science Department, Quantitative Analysis Center, Molecular Biology and Biochemistry Department, and Astronomy Department presented posters. Posters often contain text, graphics, and images that illustrate the students’ research results on a single board. Poster session attendees can view the posters and interact with the authors. The summer research program is hosted by the College of Integrative Sciences. 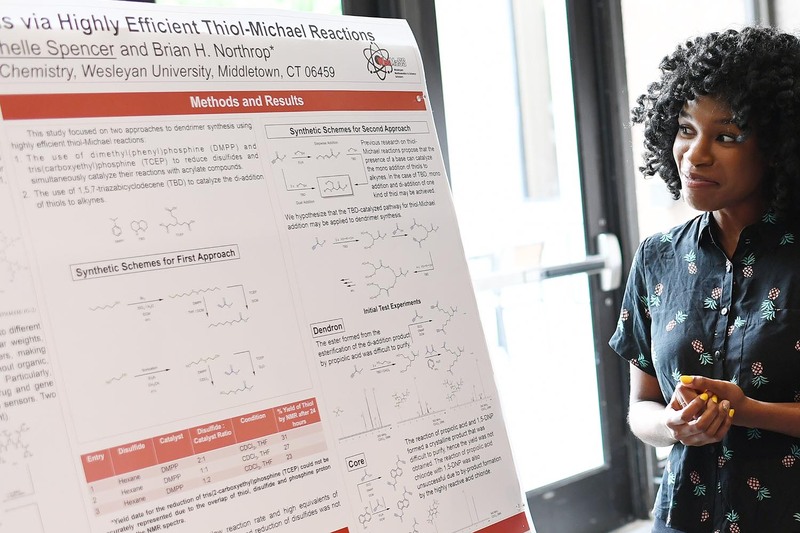 Rochelle Spencer ’20 shared her poster titled “Dendrimer Synthesis via Highly Efficient Thoil-Michael Reactions.” Her advisor is Brian Northrop, associate professor of chemistry, associate professor of integrative sciences. 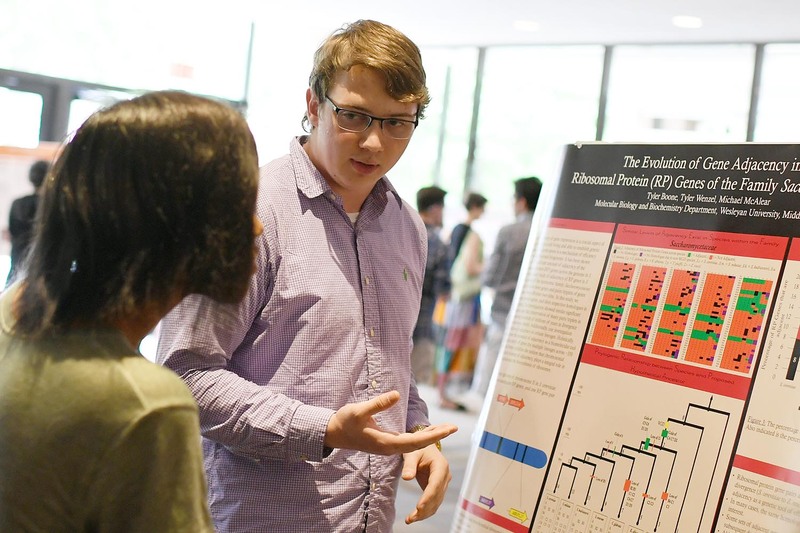 Tyler Boone ’21 presented “The Evolution of Gene Adjacency in the Ribosomal Protein (RP) Genes of the Family Saccharomycetaceae.” His advisor is Michael McAlear, associate professor of molecular biology and biochemistry, associate professor of integrative sciences. 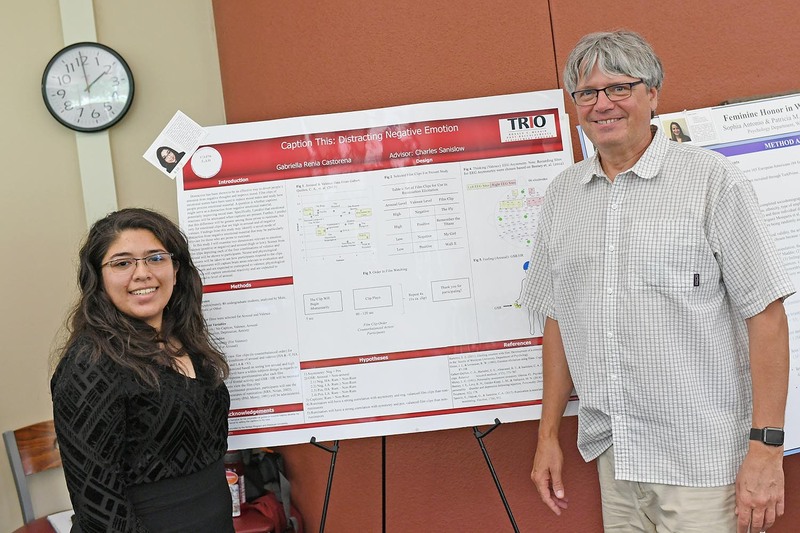 Gabriella Castorena ’19 shared her project titled “Caption This: Distracting Negative Emotion.” Her advisor is Charles Sanislow, professor of psychology, professor of neuroscience and behavior, pictured at right. 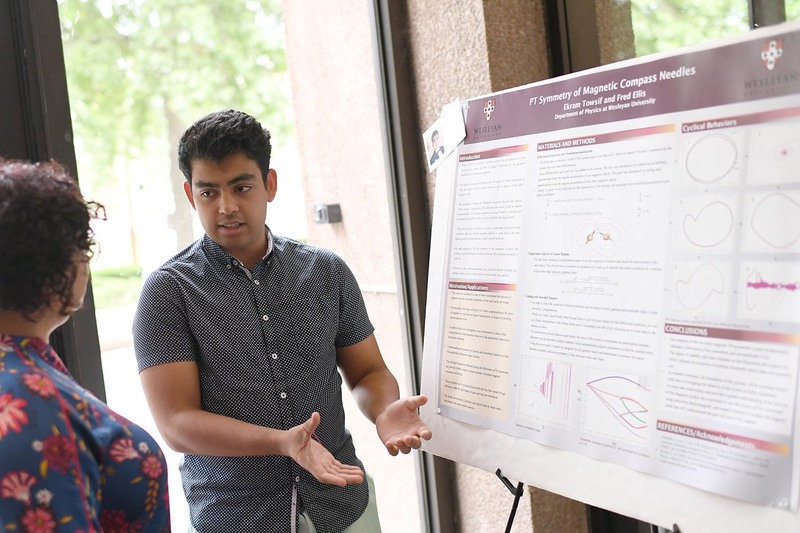 Ekram Towsif ’21 presented “PT Symmetry of Magnetic Compass Needles.” His advisor is Fred Ellis, professor of physics. 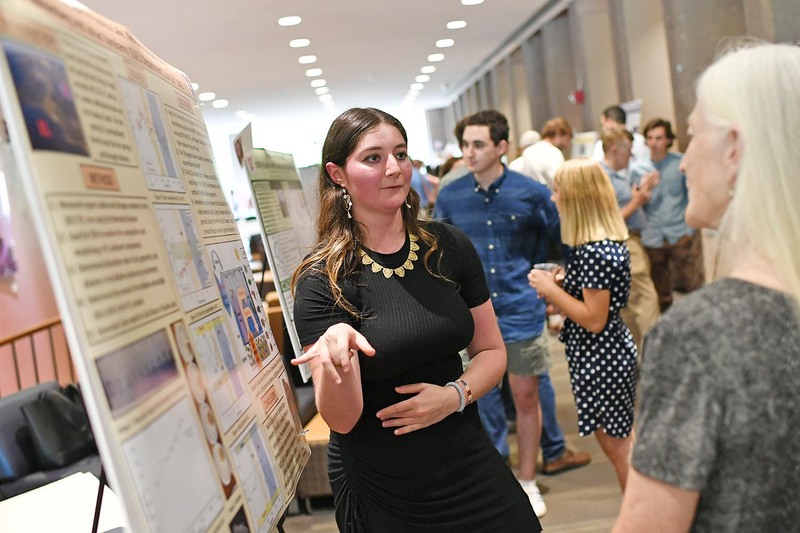 Hannah Sonnenberg ’20 discusses her study titled “The Dissolved Silica Cycle in Paulina Lake, Newberry Volcano, Oregon.” Her advisor is Johan Varekamp, the Harold T. Stearns Professor of Earth Science, professor of earth and environmental sciences, professor of environmental studies. 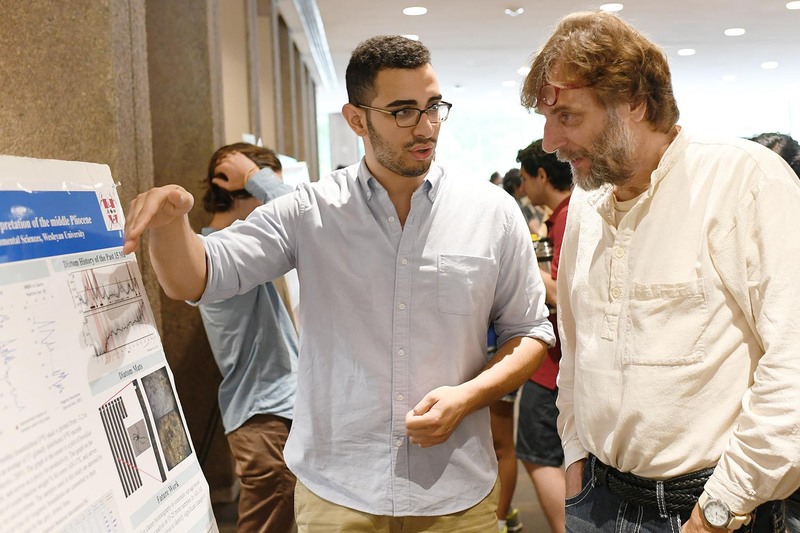 Eduardo Centeno ’19 speaks to Johan Varekamp about his research titled “Diatoms of the Antarctic – Environmental Interpretation of the Middle Pliocene.” Centeno’s advisor is Suzanne O’Connell, professor of earth and environmental sciences. May Do ’20 presented “Synthesis of Analogs of Anto-Cancer Molecule, Roclaglamide.” Her advisor is Michael Calter, professor of chemistry. 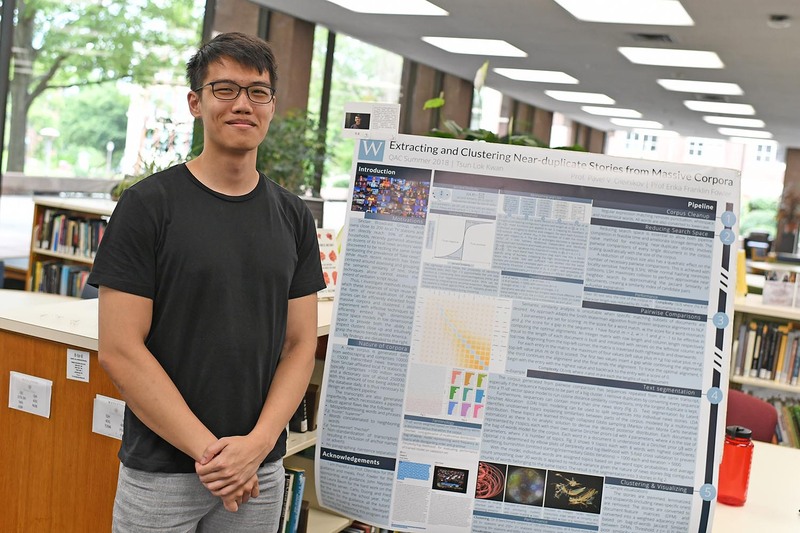 Tsun Lok Kwan ’21 shared his poster titled “Extracting and Clustering Near-duplicate Stories from Massive Corpora.” His advisors were Pavel Oleinikov, associate director of the Quantitative Analysis Center, and Erika Franklin Fowler, associate professor of government. 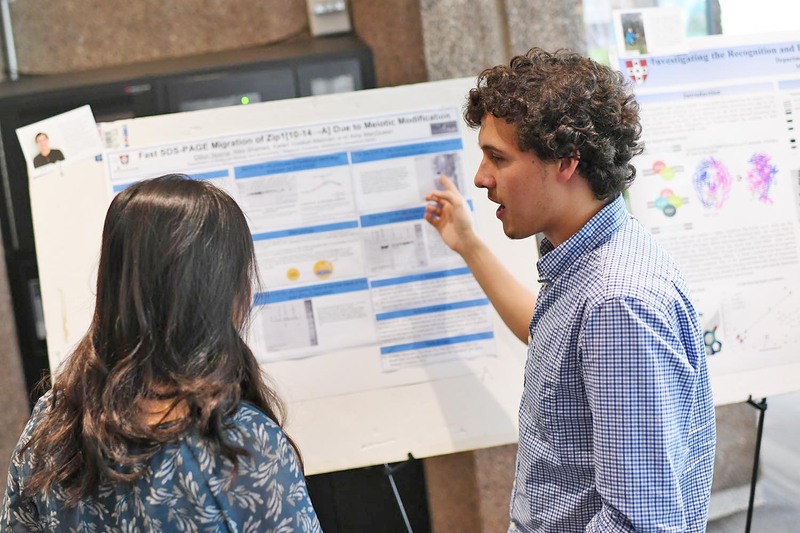 Dillon Noone ’20 presented “Fast SDS-PAGE Migration of Zip1[10-14àA] Due to Meiotic Modification.” His advisor is Amy MacQueen, associate professor of molecular biology and biochemistry. 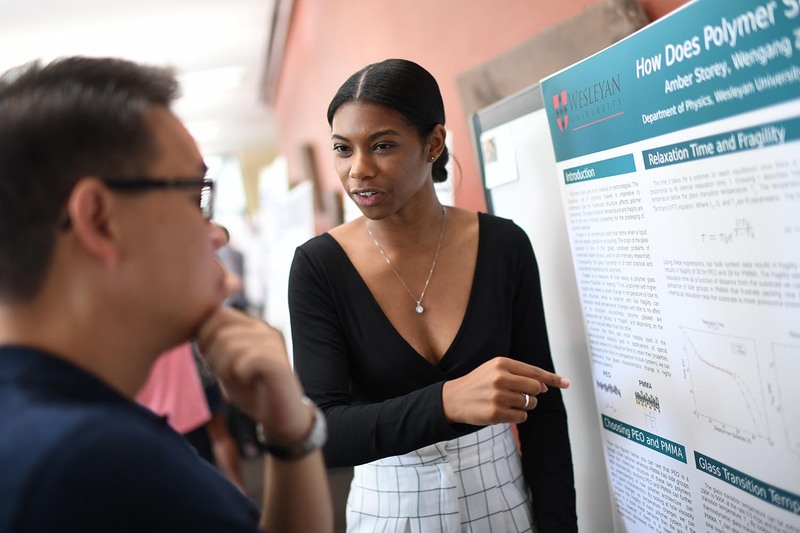 BA/MA student Amber Storey ’18 presented her research on “How Does Polymer Structure Affect Fragility?” Her advisor is Francis Starr, professor of physics, professor of integrative sciences, professor of molecular biology and biochemistry, head of the College of Integrative Sciences. 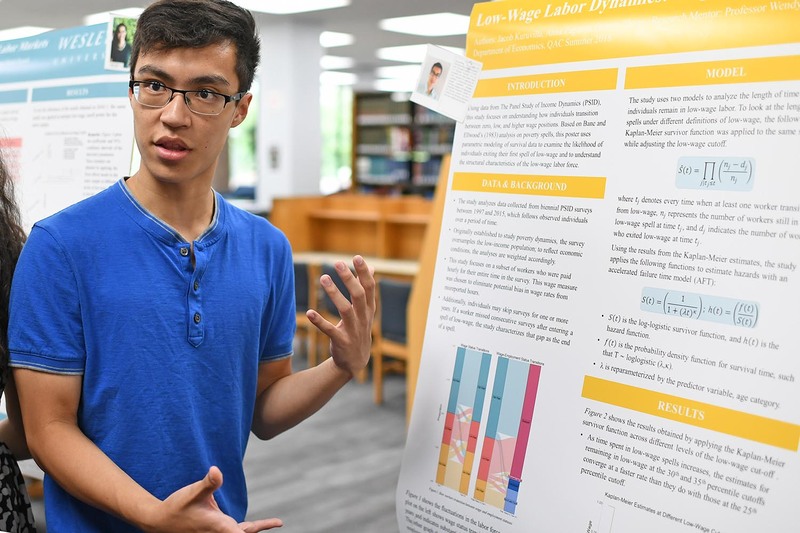 Qiyuan Zheng ’20 presented a poster titled “Low-wage Labor Dynamics: A Spells-Driven Exploration.” His advisor is Wendy Rayack, associate professor of economics, tutor in the College of Social Studies. 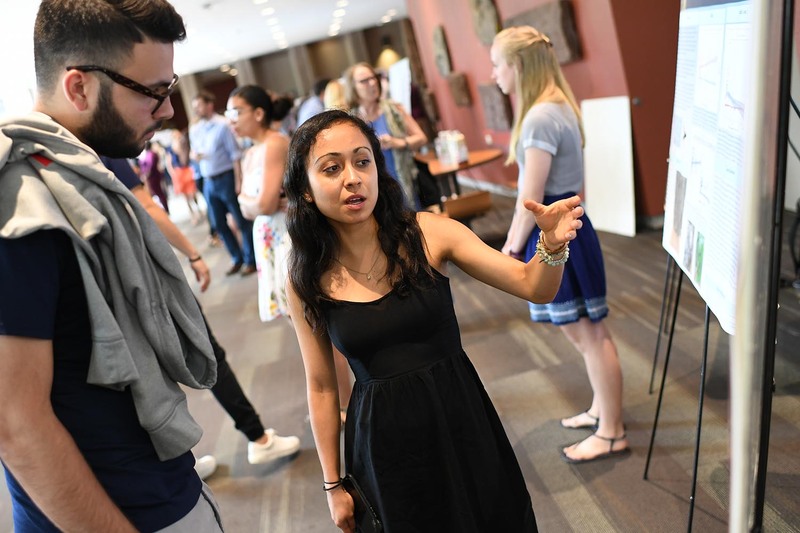 Lupita Sanchez ’20 presented her research titled “Investigating the Role of the Drosophila immune system in Octanoic and Acid Resistance.” Sanchez’s advisor is Joseph Coolon, assistant professor of biology, assistant professor of integrative sciences. 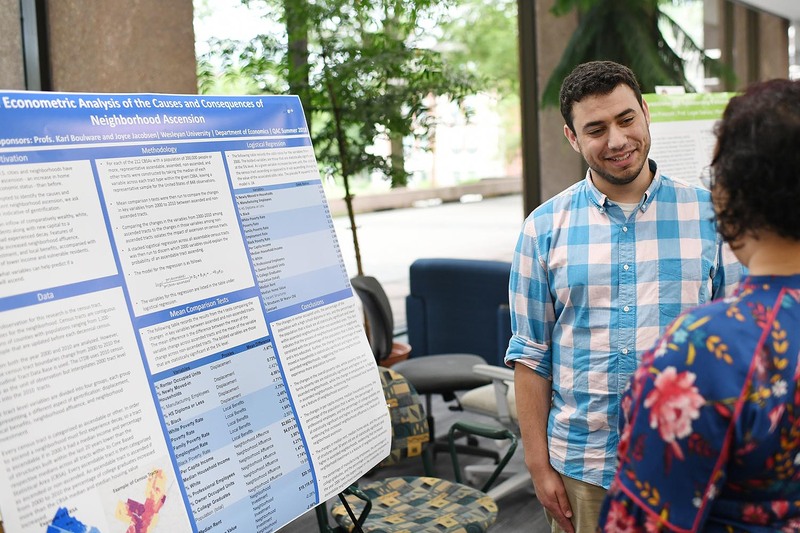 Avi Lipton ’20 discusses his research titled “An Economic Analysis of the Causes and Consequences of Neighborhood Ascension.” His advisors are Karl Boulware, assistant professor of economics, and Joyce Jacobsen, the Andrews Professor of Economics, provost, and senior vice president for academic affairs. 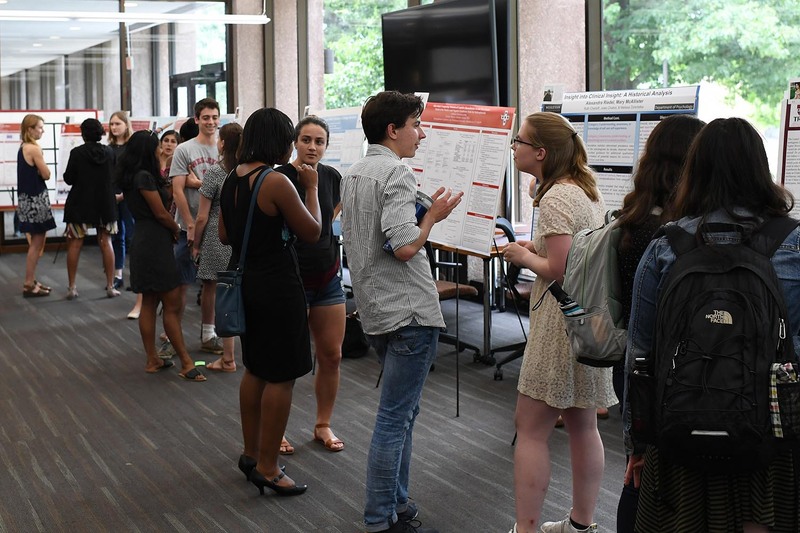 The poster session spanned Exley Science Center’s lobby and Science Library.